“How have I helped someone today?” It is a question that Yale alumna Sonia Sotomayor ’79 J.D., associate justice of the Supreme Court of the United States, says she asks herself daily. I imagine that many of our alumni share a similar practice, as service is a fundamental value of our university community. Yale was the first American university to inscribe service to society explicitly in its founding legislation. In 1964—the year, notably, in which Yale conferred an honorary degree upon the Rev. Dr. Martin Luther King, Jr.—then-President Kingman Brewster first stated that recipients were entitled not to “rights and privileges,” but, instead, were now to assume “rights and responsibilities” of their degrees. All of us who have benefited from a Yale education recognize that the opportunities we enjoyed on campus carry this responsibility with them: the duty to contribute, throughout our lives, to the common good. Every day, all around the world, Yale alumni act on this expectation and engage in service to others, both in their professions and through voluntary work. In recent years, volunteer leaders in the Association of Yale Alumni have showcased this core value of our university through the Yale Day of Service, which this year will be held on Saturday, May 9. This annual event highlights the important work that our graduates do as they give back to their home communities. 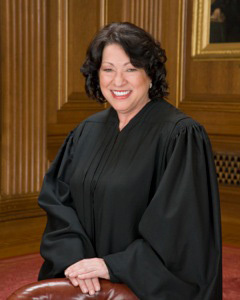 Today, I am delighted and honored to announce that Justice Sotomayor, one of Yale’s most distinguished graduates, has agreed to serve as the honorary chair of the 2015 Yale Day of Service. Her lifelong commitment to public service is truly an inspiration to all of us, as it is to countless others in our country and overseas. Justice Sotomayor has been very generous in offering her time to share in conversation both with the campus community and with alumni audiences. I am especially grateful that she has offered to lend her support to this year’s service effort. I hope that you will join the Yale community in asking, “How can we help someone?”— and that you will make plans to be a part of the 2015 Yale Day of Service in May. See the Yale Day of Service video message from Justice Sonia Sotomayer.